I started coming down with a cold last week and quickly realized that the cold weather was arriving and I had not made my fire cider for the season. Are you looking for a way to boost your immune system for the upcoming cold winter days? Something to help fight off those nasty viruses, flu bugs and colds? Have you considered crafting your own Fire Cider? Fire Cider is a popular herbal folk remedy that contains anti-viral, anti-bacterial, anti-fungal and anti-parasitic ingredients. Some of the most common ingredients used include: apple cider vinegar, garlic, onion, horseradish, ginger, turmeric, and hot peppers. When selecting your ingredients, choose the highest quality organic you can find. You want to ensure that no GMO’s or pesticides end up in your healing brew. And it’s a great bonus if you gather some of the items from your garden. If you want to keep your immune system in tip-top shape, take a tablespoon daily or 3-4 if you’re feeling under the weather. This tonic has helped me get through the ‘sick season’ quicker and stay healthier. Now off to my kitchen to make my brew! And if time doesn’t allow you to create your own fire cider, check-out your local food coop or Amazon. Tastes terrible but works. Still have some from the batch I made 2 years ago. Its in the frig. Would it still be ok to use? I can only share my own personal experience and trust you to use your own best judgment regarding the usage of your fire cider batch from 2 years ago. I personally store my fire cider up to one year from the date I start the batch. 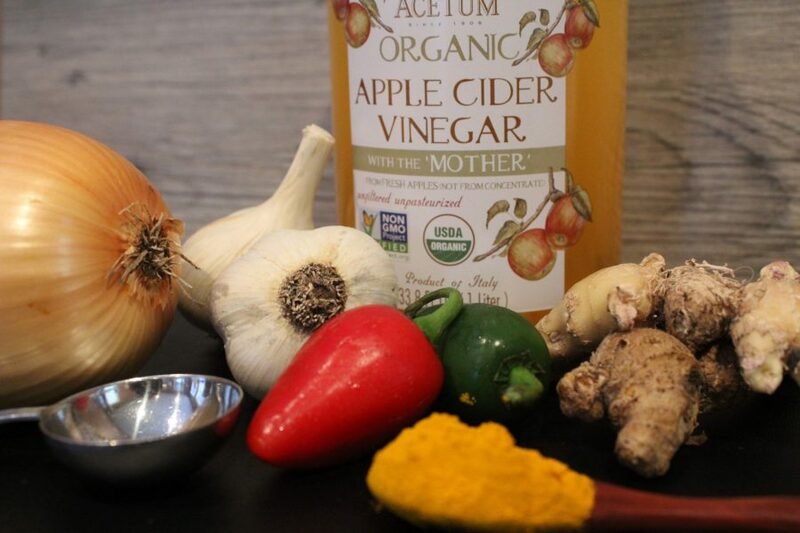 do you have the amount of each vegetable to use to mix into the Apple Cider vinegar? I would lke to make it. There are links above in the blogpost. We just updated the post to make them easier to find. Thanks for asking! Hope it turns out well for you!